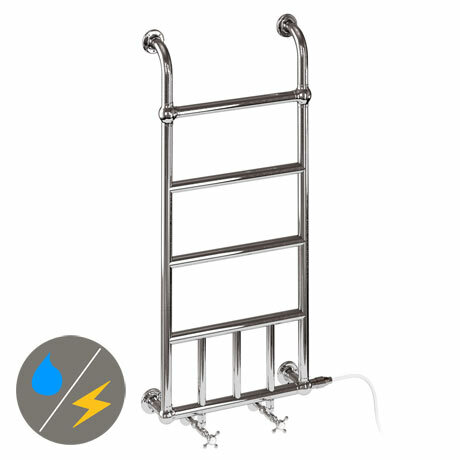 The Chaplin chrome traditional radiator with angled valves & electric Heating Kit, with its classic traditional design this radiator would look great in any period bathroom. Manufactured to the highest standards whilst maintaining the authenticity of the piece. Package includes the radiator and set of 2 angled radiator valves. Burlington radiators contain steel and are therefore only suitable for hot water (closed) central heating systems. Supplied with wall fixings. Can be wired into the electric mains for summer towel warming. Material - Tubular shaped bodies are of stainless steel with heating resistance inside.